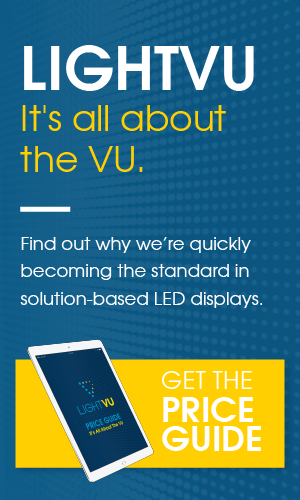 LED Displays | LIGHTVU | Blog | What Are LED Displays For? What are LED Displays Used For? any and all digital messages while communicating a WOW factor. The complicated part is that “any and all” is an extremely broad term. Let’s delve into this topic and help filter some thoughts. LED displays can be used in schools both indoor and outdoor. Outdoor, share your message with your community as they drive by the building, use it to remind parents of an upcoming event or professional development day. Indoor, showcase faculty and students by sharing their accomplishments on the displays. Looking for a new scoreboard? LED displays can do the job. There’s a trickle down effect with this and a goal to keep kids active. The small picture is that a scoreboard will help to fuel our youth’s competitive nature and increase their activity level in the gymnasium. The large picture is that a scoreboard can help attract students to your school because it provides the capabilities to host games and tournaments that allow our youth to socialize with others. This helps develop their social, physical, emotional, and mental skills outside the classroom. Thinking big? ‘Wow’ your clients with a full LED video wall! Are you an architect? You probably want to showcase your work. All. The. Time. Why wouldn’t you? You can talk the ear off a potential client but they want to see what you’ve done; they want to visualize what you can do. Imagine this: you bring your client in for a presentation and you’re hoping to pitch a project. What better way to grab their attention than an entire wall showcasing the product you’re trying to sell? Life size. Realistic. Engaging. Use LIGHTVU’s LED displays to show them what you’re capable of. Show them what you can deliver. Organizing or hosting an event? Think about staging. Browse our rental options to offer your guests an experience they won’t soon forget. Think about all the dynamic visuals you can provide; custom backdrops for different speakers, brighten up the room with various layouts to create an aesthetically pleasing display. Your guests are likely sitting and may grow antsy, why not provide an interactive viewing alternative to keep them engaged? It might seem minor; but displays make an impact on your guests’ memories. We’re not saying it’s a make-it-or-break-it decision, but it almost always adds to your guests’ experience. This is that ‘wow’ factor you’ve been searching for. Ready for the next step? ? Download our price guide and contact us today! Looking to save on long term costs? If you manage a restaurant, why not display your menu on a long life, low maintenance screen? Picture this: brand yourself as environmentally friendly because you don’t have to print new menus every time your price or menu options change. Highlight the cleanliness of your restaurant; did you know that menus are one of the dirtiest items in a restaurant? Why not eliminate that altogether? Thinking about LED displays for lobbies and waiting rooms. There isn’t much for people to do when they are waiting, there isn’t anywhere for them to go either. What a fantastic opportunity to engage your customers! They’re in your building, they already have you on their mind, it’s time to bring it full circle while they wait for their appointment. This is a twofold method; first, give them information. Share your services or upcoming events, provide product or service tips. Second, keep their attention. Provide a positive customer service experience by showing them you considered they are spending their time waiting for you so you wanted to ensure they aren’t sitting there thinking they are wasting their time. Provide their kids with an activity to participate in, keep their mind off what might be some potentially negative news coming their way. The options and ideas are endless. Show them you thought about being in their shoes. How about outdoor LED displays? There are numerous ways LED displays can be used outside. Enjoy increased flexibility and dynamicity by sharing real time information, feature different forms of content to capture the attention of potential customers, provide public service announcements, warnings, and updates, and so much more! This is just the tip of the iceberg; with LED displays the opportunities are endless! Let’s get started on your project today!